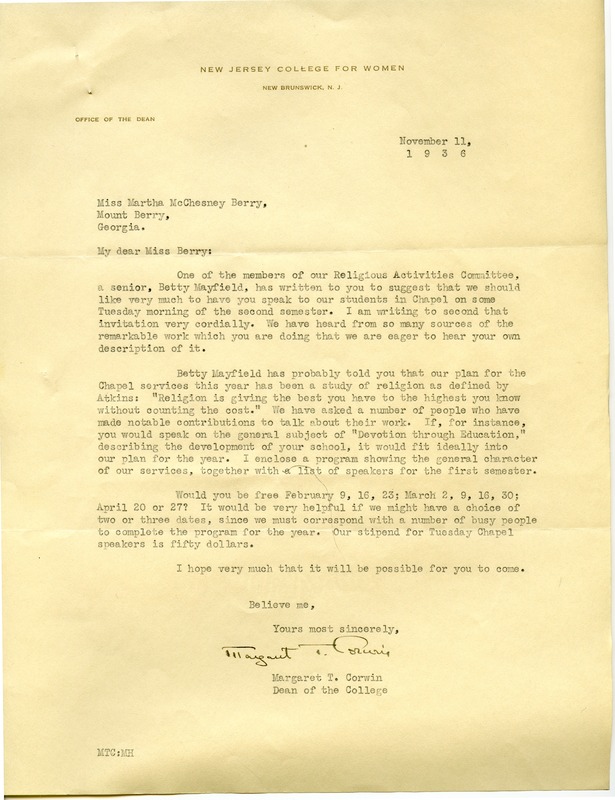 Margaret T. Corwin is following up after a letter one of her seniors, Betty Mayfield, sent to Martha asking her to come speak at the New Jersey College for Women during the second semester. She would like to second the invitation. She explains that they are doing a series on religious giving and are inviting people to come talk about their work. She suggests a few possible dates and states the stipend for guest speakers. Margaret T. Corwin, “Letter to Martha Berry from Margaret T. Corwin.” Martha Berry Digital Archive. Eds. Schlitz, Stephanie A., Chelsea Risley, Allison Moore, et al. Mount Berry: Berry College, 2011. accessed April 25, 2019, https://mbda.berry.edu/items/show/448.